I shouldn't be upset but I am. I don't remember the last time any Yankees news incited anger out of me yet this one pinched a nerve. ESPN has reported that Adam Warren has been moved to the bullpen. I wrote a fierce defense on Warren not too long ago explaining how the move of Warren would be based more on politics than merit. Lo and behold, the Yankees made a genius out of me. Just a short while after the 3-8 with a 5.59 ERA Sabathia lost another game, the Yankees made their announcement. Interestingly enough it was made after the clubhouse was closed so Warren was not available for comment. That's about the only smart move in this whole situation the Yankees have executed. What would you expect your employer to say? I'm pretty sure as you read this he is being prepped in the art of biting his tongue. Let's summarize things for a moment. You have a little engine that not only could but did. He outperforms the supposed ace of the staff for which he earns only a fraction of his pay. He works hard, plays right, does as he's told and is demoted. If actions speak louder than words, what the Yankees are really saying is they don't have faith in him long-term. It's your typical thank you but no thank you. What cracks me up about this is how when pressed on the situation before the game yesterday Girardi said "we haven't reached a decision yet." What's next? Maybe we move Carlos Beltran into a starting catcher role and trade McCann. How about we put Andrew Miller to start games and move Eovaldi to the closing role. Better yet how about we take our hot hitting American League player of the week and sit him down when there's a lefty starting pitcher. Oh wait, I think I've seen that one before! 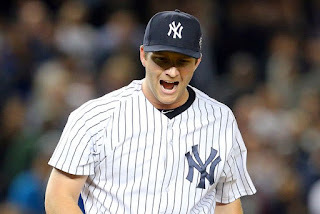 When I think of Adam Warren I think of pitchers like Aaron Small and Chien Ming Wang. They didn't have the sexiest of stuff but they found ways to win. This coming in an era when the Yankees wanted to win. These days I'm not sure what it is they want to do. You should know that this was written to the tune of Michael Jackson's "They don't care about us" on repeat. Follow the @BronxBomberBlog on twitter for more Yankees news, updates, analysis, satire, live game tweets and all things Yankees!